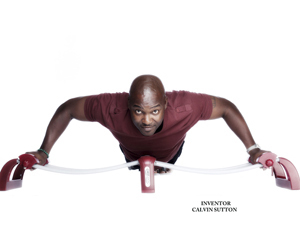 Calvin Sutton with his invention, Chest Magic. Have you ever come up with an invention but didn’t make it happen because you didn’t know where to start? Then the next thing you know, you see your invention featured on television, but the patent is not yours. University of South Florida economics student Calvin Sutton didn’t want that to happen to him. His invention is a simple device, built for ease and affordability, which allows you to work out your chest, triceps, biceps and abs. It was accepted to be featured on the Discovery Channel’s show “Pitchmen,” hosted by Anthony “Sully” Sullivan and formerly co-hosted by Billy Mays, who died in 2009. Sutton’s episode will air Tuesday, Feb. 22 at 7 p.m.
“I was trying to figure out a way to work upper body at home, other than just push-ups because not everyone can afford the big chest machines,” Sutton said. “I always struggled with coming up with a way to work your chest at home in a convenient manner for a reasonable price. Sullivan scours the country, holding "Pitch-a-Thons" to give people’s inventions a shot at catching his eye but in Sutton’s case, he submitted it to the show himself. To invent a product, Sutton said, you have to start by asking yourself a few questions. After he envisioned Chest Magic, he spent hours scouring the Internet for a company that could build his prototype. From there, he was ready present it to "Pitchmen." Sutton hid his invention from his wife and four kids until he had the working prototype so that he didn’t have to hear “I told you so” if it didn’t work out. Now they think his invention is ingenious, Sutton said. Sutton spent 20 years thinking up an invention. Meanwhile, he got an associate’s degree in health science from Sante Fe College in Gainesville, Fla., worked for the Home Shopping Channel with Billy May, owned and operated FedEx routes, did storm clean-up in New Orleans after Hurricane Katrina and worked as a personal trainer for more than 10 years with athletes like NFL players Errict Rhett and Damien Robinson and MLB baseball player Gary Sheffield. But how did he come up with Chest Magic? Sutton said he drew up paperwork a few years ago for a small, flexible ball to exercise with. In 2009, he saw that the Bender Ball had been patented and he missed his chance. “When you come up with something, you have to act on it or someone else will,” Sutton said. After years of real-world experience, a marriage and four kids, Sutton is back at school pursuing a degree in economics.